Coppicing is a woodland management method in which the wood from a tree is harvested by cutting a suitable tree near ground level. It subsequently regrows over a period of years without needing to be replanted. This technique is different from pollarding, in which branches are cut at, or above, head height, leaving the possibility of grazing underneath the growing branches. Coppicing is done on rotation: small areas of a woodland are cut each year in sequence leaving the areas not being cut to grow on for between 15 and 20 years for chestnut, and about 7 years for hazel. When an area of coppice is cut, it is all cut down, and creates a clearing. This periodic coppicing encourages the individual trees to live for up to hundreds of years. If the coppice cycle is managed correctly it can increase biodiversity in the woodland because of the beneficial effects of varying light levels reaching the woodland floor, and the range of different aged trees and stools in the woodland. The best time to coppice chestnut is well after the autumn leaf fall when the sap has gone down, and certainly well before the sap rises in the spring. Clear out all leaves and other debris around the base of the stool. Cut and clear away any dead or dying stems. Progressively cut each stem starting with the most accessible sections and working in to the centre of the stool. Ideally one cut should be made about 1-2 inches above where the branch grows out of the stool. That cut should be angled some 15 to 20 degrees from horizontal with the lowest point facing outwards from the centre of the stool. In some cases it maybe necessary to make a first cut higher and then trim back as above. Fell away from the wind and fell all the poles in one direction. Always leave a fire in a safe condition when leaving the woodland. Once cut, the poles produced are usually processed to some extent in the woodland: they are often cut to length, and perhaps de-barked. In many cases the coppicer will process further and create spiles (stakes or strong fencing posts), or will split the chestnut into various sizes for fencing. Some even make hurdles for keeping sheep in pens. In the UK the main trees that are coppiced are sweet chestnut, hazel and hornbeam. Chestnut has traditionally been used for fencing whereas hazel is more likely to have been used for thatching, hedge-laying spars and hurdle making. Hornbeam was used for charcoal making. 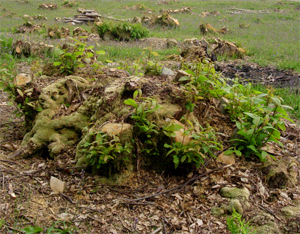 Historically chestnut coppice growing has been strongest in the south East of England, especially Kent and East Sussex. Although it is said that the Romans introduced it, there is some evidence that coppicing was practised in England in Neolithic times. There are many areas of the UK where hazel and hornbeam have been grown, but the Midlands and Devon still have much hazel woodland useful for the remaining thatchers. […] second activity involved the pollarding and coppicing of willow near the reservoir. We are enjoying great success with poplar. We planted the first slips winter 2010/11 and are now felling our first “harvest” which will season this year and be ready for the log burner next winter. We planted approx 1000 slips in 2/3rds of an acre. I’d plant at 2 metre centres in rows 3 metres apart, you can always thin later. Prepare the ground, ensure there’s no waterlogging in winter, keep them weed free until they are well-established. Are you soils suitable for hazel?